Where does hōlua sledding take place? How would you explain hōlua to someone who doesn't know anything about it? Why are the papa hōlua (sleds) so narrow? What is the function of the pili grass? Can you think of places in your neighborhood or on your island that might be suitable for hōlua sledding? What are some ways you could enjoy this sport even if you don't have an actual papa hōlua? What is the difference between hōlua and sledding in other parts of the world? 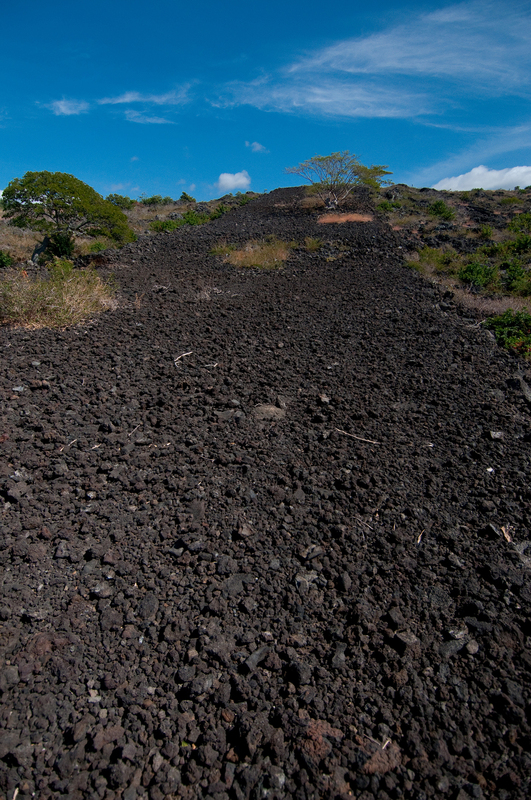 Do you think the kahua hōlua (hillside for hōlua sledding) in Keauhou should be restored so it can be used again? If so, where should the funding come from? If you wanted to make a papa hōlua, where would you get the materials? Could you do it without nails and screws? Try making a miniature papa hōlua with materials available at home and in the classroom. One who rides a hōlua sled. Said proudly of being a descendant of the chiefly families of Waipiʻo, Hawaiʻi, who were well known for their skill in hōlua sledding. Have you ever ridden a bike downhill? Or slid down the face of a big wave? How did it feel as the wind rushed past your face? Now imagine traveling down a mountain at fifty miles per hour! That’s what’s involved with heʻe hōlua. Heʻe hōlua is the extreme sport of sliding down mountains. The word “heʻe” refers to sliding or riding, as found in the term heʻe nalu (to surf). The word “hōlua” may refer to sliding in pairs or tandem. “Hōlua” also refers to the synergy of all components­—the sled, the rider, and the course—when sliding down the slope. Amazingly, heʻe hōlua riders were also known for standing on their papa hōlua (sleds) like surfers on a wave. Whether lying down or standing up, it is no easy task traveling down at speeds exceeding fifty miles per hour…and staying alive! Heʻe hōlua has been compared to surfing the big waves of Waimea Bay! Was there more to heʻe hōlua than sliding down a mountain? Heʻe hōlua tested not only the physical strength and stamina of riders, but also their spiritual and psychological resilience. To some, heʻe hōlua was more of a ritual than an exhibition. A major part of the philosophy of heʻe hōlua was tied to clashes between Pele, goddess of volcanic activity, and her elder sister, Nāmakaokahaʻi, goddess of the ocean. When Pele’s lava reached the sea of Nāmakaokahaʻi, you could hear them fighting in the explosions and hissing of the ocean breaking down the lava. The motion of heʻe hōlua attempted to recreate the flow of lava into the ocean. Just like football, basketball, or baseball, there were winners and losers in heʻe hōlua. According to Davida Malo, the first competitor would give his sled a push and mount, then the next contestant would follow. The heʻe hōlua rider with the longest run down the course would win. However, the long ride of heʻe hōlua eventually came to an end. The practice of heʻe hōlua was extinguished through efforts of early Christian missionaries who viewed the sport as dangerous and frivolous. The last documented heʻe hōlua racing event was held in 1825. 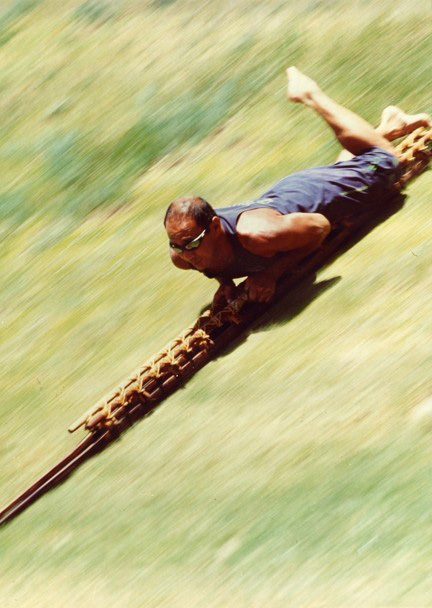 It’s been said that heʻe hōlua is the predecessor to other extreme sports like bobsledding and luge. Can you imagine heʻe hōlua as an Olympic event? What is a hōlua sled like? 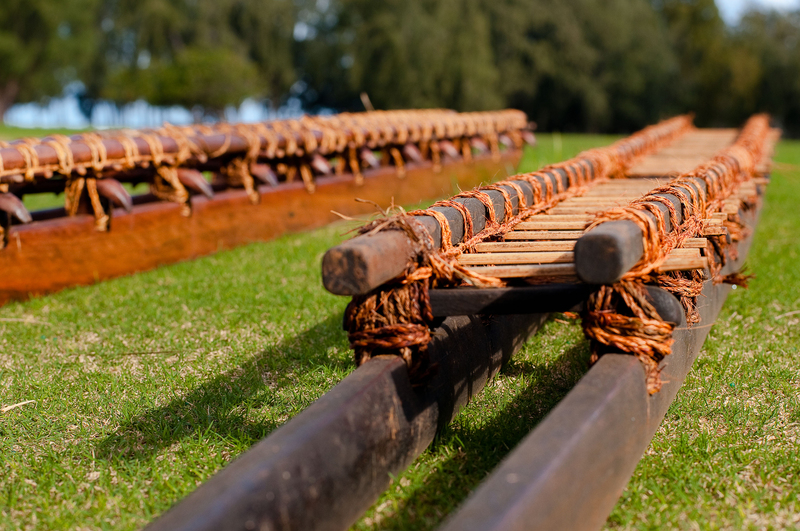 Papa hōlua, or hōlua sleds, were crafted according to the dimensions of the rider and the course. Most papa hōlua are about twelve feet in length, four inches in depth, and five to six inches in width. The papa hōlua should not be too wide because the friction created by riding on stones will easily pull the sled apart. The papa hōlua consists of three main components: the runners (the part that runs like ice skates on the stone course), the crosspieces (the part on which the rider lies and the runners are joined), and the handrails (the part that is gripped for balance). The runners could be made of different woods, including māmane, uhiuhi, ʻōhiʻa, and ʻulu. The front end of the runners curves upward like a plow so as not to dig into the ground. The boards are laid on the crosspieces like flooring on the pola or deck of canoes. The top of the papa hōlua is covered with finely woven matwork for the rider to rest on. The handrails are lashed to the runners upon bamboo strips. All parts and pieces are lashed together with aho (cordage) of coconut or olonā fibers. This is much like the joining of waʻa kaulua (double-hulled canoes). No nails or screws are used! Papa hōlua would then be oiled with kukui nut oil to reduce friction between the sled and slope. The addition of the final piece—the body of the sled rider—completes the union mentioned above as hōlua, a coming together. The Bishop Museum is home to several papa hōlua. One belonged to Lonoikamakahiki and is several hundred years old! Talk about durability! Pua ke kō, neʻe i ka heʻe hōlua. When the sugarcane tassels [blooms], move to the sledding course. 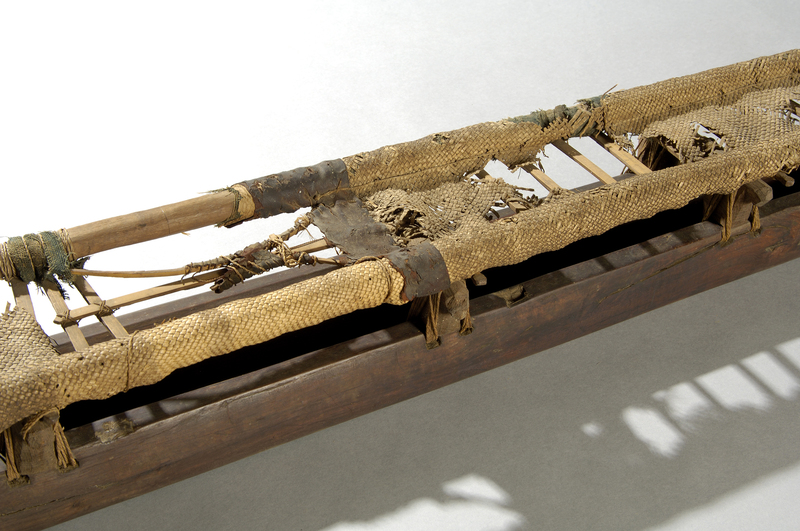 The tops of sugarcane were used as a slippery bedding for the sled to slide on. The kahua hōlua is the hōlua riding course. Some kahua hōlua spanned a mile or more in length, like the famous Kaneaka course in Keauhou, Hawaiʻi. Kaneaka was the longest kahua hōlua of Hawaiʻi nei, and it is the best-preserved. This manmade course remains approximately 1,300 feet in length, although it was probably more than 6,500 feet long before cattle, earthquakes, tree growth, and modern construction destroyed parts of it. The foundation of a kahua hōlua was first set with larger stones and later filled with smaller stones. A layer of dirt was put on top of the stones. Then, pili grass or sugarcane was placed on the dirt. Heʻe hōlua competitions were held during midday because the sun’s heat would extract the oils of the grass or the leaves. This oil reduced friction between the papa hōlua and the kahua hōlua so the ride would be faster and smoother. Whether naturally formed or constructed, the kahua hōlua went from mountain to sea. The steep incline of the mountain or hillside would lead the heʻe hōlua to either a level plain or to the seashore. Other ancient kahua hōlua include the south side of Pūowaina (Punchbowl Crater) on Oʻahu, and Kahōluamanu in Waimea, Kauaʻi. Another is the once five-thousand-foot-long kahua hōlua at Kahikinui on Maui. Do people still practice heʻe hōlua? Since about 1993, Tom “Pōhaku” Stone, an accomplished surfer and surfboard shaper, has endeavored to revive heʻe hōlua in Hawaiʻi. His efforts have been recognized both locally and internationally. Stone is also a community college professor and has taught more than 250 students to build and ride papa hōlua. He’s personally built more than one hundred papa hōlua. Stone also created the Hawaiian Boarding Company, which constructs papa hōlua using traditional methods and materials. Now, what might the cost be for a papa hōlua? Well, Stone sells them for about $3,000 and stated that it would take him two weeks or twenty-four hours nonstop to complete one. He hopes not only to ride restored heʻe hōlua courses but also to hold a traditional heʻe hōlua competition. A competition might judge contestants on both their riding style and length of ride. Ride on! The following story is being retold from The Legends and Myths of Hawaii by King David Kalākaua. Long ago, in the district of Puna on Hawaiʻi Island, lived a young aliʻi named Kahawali. He was very well-off because his lands were fertile and productive. During the time of makahiki, typically between mid-November through January, a heʻe hōlua competition was announced between Kahawali and his pal, Ahua. Many women, men, and children gathered to watch the competition between these two experts. With a short run and a head-first jump, Kahawali descended victoriously down the kahua hōlua slope. With papa hōlua under their arms, Kahawali and Ahua ascended the slope to slide down again. Just before they were about to jump onto the kahua hōlua, a woman stepped forward and boldly challenged Kahawali on Ahua’s papa hōlua. After a few exchanges of banter, they both decided to race, and Kahawali was more than confident that he would once again be the first to reach the foothill of the slope. He indeed reached the bottom of the kahua hōlua first as the woman lost her balance on the way down. To the cheers and jeers of the spectators, they both climbed to the top but the woman was angry and insisted that they trade papa hōlua. The woman with a flash in her eyes mentioned that his papa hōlua was superior, and therefore the competition was not fair. Kahawali didn’t know the woman and didn’t want to swap papa hōlua with her, so he jumped out ahead and descended once again. The woman stamped her foot, and a river of flowing lava poured forth into the valley. As Kahawali reached the bottom he saw that the woman was actually Pele, goddess of volcanic activity. She rode on a crest of lava down the hillside, destroying everyone and everything in her path. Pele was intent on catching Kahawali, but he escaped to sea on a fishing canoe. Kahawali never returned to Puna lest Pele exact vengeance upon his people again.